I’m looking at a house potentially to buy. Right now the 10 acres behind it is an empty field. However they are starting to build a Recreation Center pictured below and will be complete by 2020. Will this properties value increase or decrease in your estimation? 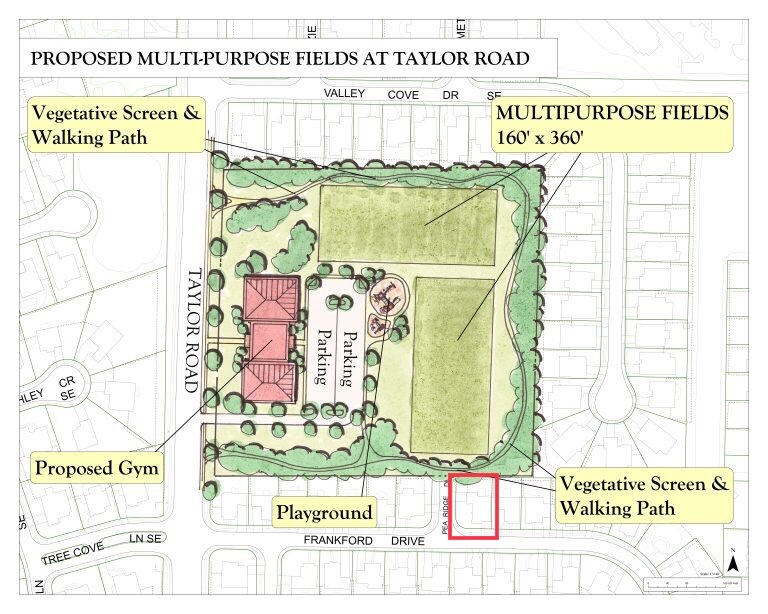 The lot/property in question is highlighted in red. I see no problem with it as long as it’s well managed and not a place for kids to just cut up. If it’s a problem I’d just build a privacy fence and put a gate with a lock for you to access it when you want. I’m not sure it increases or decreases property value. It may increase or decrease how fast or slow it sells. It seems well planned so I’d think it will be fine. I’d think the lack of a rear neighbor might give you a slight bump, but not much of one. Agree that a good fence will be a necessity. Will the playing fields have nighttime lighting? That can be annoying. It seems well planned so I’d think it will be fine. It seems pretty well planned to me. There isn’t anything remotely like this anywhere in the city so the City Parks and Recreation is all over it. However, I am concerned people would park in front of he house etc to access the multi-purpose fields. Would I have remedy in case this happens? No HOA if that matters. Agree that a good fence will be a necessity. Right now the fence is about waist height with about 1 foot separation between slats. Definitely would need to be improved. Will the playing fields have nighttime lighting? Good question I guess I can call the City and ask. Watch Parks and Recreation. They spent years getting a park/rec center built next to Ann’s house. Confirm if the city is paying for directional lighting or going with old school lighting. Huge difference. I absolutely can't commeot on your property value, although I will say that in general being near a good park system is typically a bonus/postiive thing relating to value. Might just depend on the area though. In my city, there is a rec center at the end of a residential neighborhood kind of like what you have. You can throw a golf ball from the front of the rec center into the across the street neighbor's front door and that house is valued at damn near a million. Not relating to property value there are some things to be aware of. As others ahve stated you back up to the field which may give a bit of a pause especially if it will be lit. Even if it's not lit, you need to go ahead and accept that from about March - November that field is going to have activity every weekend and most weeknights. I would definitely get a fence taller and more private that what you currently have. It also looks like parking could be an issue especially on Saturdays. Think about multiple soccer games (for younger kids they can paint several fields on the big green grass in the picture), on 2 different fields, plsu basketball games in the gym. Inevitably there will be days where people can't find parking so some folks may look at Pea Ridge drive right next to your house. Not to mention if the gym hosts special events like dances or local/state tournaments. Perhaps see if the city can paint some curb on there or put up no parking signs. One last thing off the top of my head is that if the gym is going to be an "open gym" type of place (ie, when activities aren't going on the public can come in and pay a drop-in fee to play) that absolutely attracts a certain clientele. Be prepared for an influx of booming-bass stero systems in your neighborhood. Nothing you can do about it, just saying to expect it. 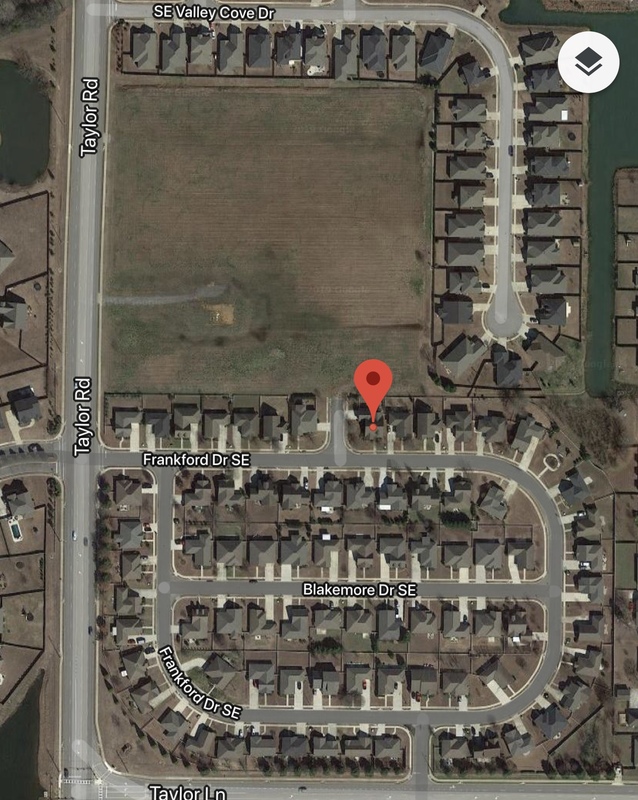 If Frankford Drive just goes back into the neighborhood you probably won't be affected but if it connects to a main road you might. It also looks like parking could be an issue especially on Saturdays. Think about multiple soccer games (for younger kids they can paint several fields on the big green grass in the picture), on 2 different fields, plsu basketball games in the gym. Inevitably there will be days where people can't find parking so some folks may look at Pea Ridge drive right next to your house. Not to mention if the gym hosts special events like dances or local/state tournaments. That was a major concern I expressed in the OP. People parking along the street. Pea Ridge Drive actually is the access road for the garage. This is what the area looks like currently. If the city does put up no parking signs what recourse do I have if people disregard the signage? You don't want to live way out in Owens crossroads.